Green Laker: Green Lake Super 8, 1983! My brother has been digitizing some of our old family super 8s over the past few months. Here's the first of hopefully many. I'm pretty sure that this reel was shot in 1982 (note - just confirmed as '83, I've made edits). 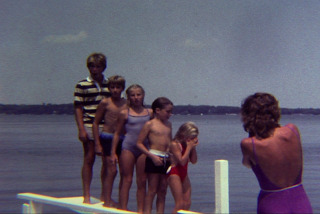 Our cousins, the Bloeckers, would have a week's vacation overlapping with our two weeks up at my grandparent's place on wonderful Green Lake, WI. Having many kids around always made for the best weeks, the week when it was just our family and the cousins weren't there was pretty mellow. Kind of hard to play hide-and-go-seek, kick the can, ghost in the graveyard or rag tag when it's just you and your brother. Back-in-the-day tubing consisted of wrapping a ski rope and handle around an old truck inner tube and towing it behind a Lund fishing boat sporting 20 HP. No 300HP Ski Nautiques for us! I'm the scrawny toe head kid second from the left. Behind me is cousin Jeff while my cousin Kimmy is in front of me. In front of her is my brother Dan while cousin Lindy is in the front, clearing water from her face. The video looks a little crummy as had to compress the file down quite a bit (from 3.2GB to 6.5MB) to fit YouTube's file size limits. If anyone wants a disc with the uncompressed file, let me know. 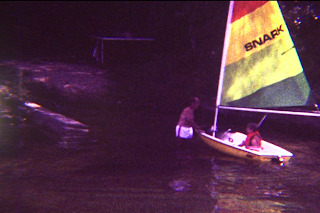 The sailboat at the end was bought from a Sears in Indianapolis with help from my parents. I saved up a few hundred bucks from mowing lawns, delivering newspapers and shoveling snow (all things kids no longer do) to pay for half of this plastic-covered foam Snark that sported a whopping 60 square foot sail. Still I managed to teach myself to sail and have a great time doing it, even if the wind wasn't blowing this particular day. Chris, that looks great. You and Dan keep them coming! I miss Green Lake! Thanks for reminding us of how much fun we had. I wish we would buy a place and continue the Green Lake summer tradition. What a great thing that would be to pass on to our kids!